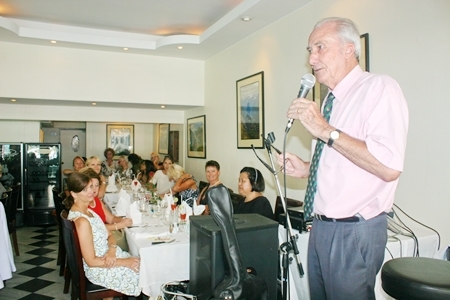 The first Tuesday of the month is, as always, reserved for the Pattaya International Ladies Club lunch. 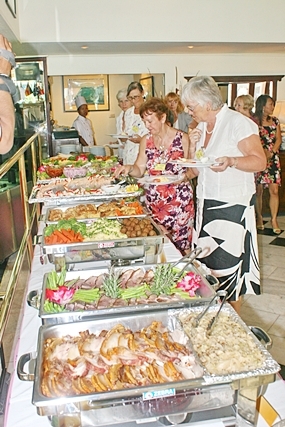 June’s lunch was this time held at the Scandinavian restaurant Linda’s, in Jomtien. Not only was owner, Linda Eikland, a great host to all those attending, but she had more importantly put together a wonderful buffet lunch with a Scandinavian twist, such as the different kind of herrings and roast pork which reminded the Scandinavian ladies of Christmas at home. The guest speaker for the lunch was Dr Iain from Bangkok Hospital Pattaya who had been invited to provide PILC members with information about patient’s rights in Thailand. He explained for one thing how important communication is between doctor and patient to ensure the best possible treatment and results. The talk was very interesting and informative for all. Dr Iain Corness provides PILC members with information about patient’s rights in Thailand. Also present was Preeda from the Thai House Museum who displayed a some of his historic white and blue porcelain collection, something for all tastes. Preeda also invited Club members to tour his museum. As always everyone enjoyed the lunch and, most importantly, each other’s company. The next lunch will be held at Silver Lake on the 3rd of July. Linda Eikland and staff gave good service during the June PILC luncheon. Linda’s restaurant put on a good spread for the ladies.